Glowlab is pleased to present the writings of Los Angeles independent curator Chris Balaschak, who recently produced the Itineraries exhibition at Gallery Luisotti in Santa Monica. The following text accompanied the exhibition, and we are publishing it in three parts. Included here is part two; part one can be found here, and part three will be published on October 1. Prior to the writings of postmodern geographers such as Mike Davis, Frederic Jameson, or Edward Soja, Ed Ruscha closely considered the intersection of the landscape of Los Angeles and the narratives (often literally words) that signified relations to the urban space. Displayed within the books Ruscha produced during the mid-1960s one finds a particularly adept representation of the itinerant geography beneath the facades of the city. Ruscha's books reveal the city as a commute space built upon lines and movement rather than distinct points of centricity or periphery [iii]. Though since the 1960s populations have risen and sprawl has expanded, there is a flux and freedom of movement that endures fundamental to Los Angeles. The dedifferentiated landscape Ruscha documented in his photo-books of the 1960s has only swelled, while the car, the road, and the drive are still definitive to this landscape of greater Los Angeles. These elements of greater Los Angeles lead to the dedifferentiation of the landscape, a site of equivalent points made so through the fluctuating, variant movements of commuting bodies. When Ruscha arrived in Los Angeles in the late 1950's the city was already a palimpsest of lines by which one could traverse the city. The Thomas Guide has sold its explanation of the greater Los Angeles landscape since the very first edition in 1946. New maps layer upon others, further complicating the complex patterns of the city. Los Angeles has changed its geographical stance little since the 1960s and it is only the globe that has shifted to accommodate the ascension such a global city formed through commutation. The famous Ed Ruscha book Every Building on the Sunset Strip of 1966 captured a landscape of Los Angeles that conveyed the complex task of defining a landscape without an explicit center. Sunset Strip serves as a map of Ruscha's movement in the city while conceding that this is only one of many potential maps and itineraries underlying the presumed common landscape, the façade, of the city. It is in Ruscha's book that we find the tension between an identity for this façade and the individual relation to it, the paradox of public space defined through private experience. For Ruscha records a commute, his back and forth movement across the Strip, while also producing a book of these images in a volume that a larger public audience could hold in common. Though one would presume to know the space of the Strip as one reads Sunset Strip, here one must remember that it is Ruscha's experience through this space. Ruscha documents the city as detached from any collective consensus of identity, while proclaiming the individual as both defining and signifying a common landscape for the city. In being so the common landscape was deferred, it was not common. Such commonality is only conjecture. For beneath the facades are other narratives to this book, other maps and itineraries foreign to Ruscha's own commute through the city. Intersections, pedestrians, and cars other than Ruscha's beckon us into the mystery of their experience on the Strip. When one reads Sunset Strip (though all images and address numbers, it is a book to be read), we not only are led upon Ruscha's itinerary but cross with others and create our own. The city Ruscha depicted in Sunset Strip was no longer a common subject but an object in common, a book produced for individual consumption. Ruscha's own desire here was for anonymity on the part of the author [iv]. For Ruscha, any reader was also the author, the photographer, and the driver down the strip. The book in question was produced in an edition with a complete run near 5000 copies (after the second and third editions were printed). Though they are often mythically attributed the quaint and delicate title of 'artist's books' the quantity of these editions leads one to believe these were intended more of a mass-market document [v]. Ruscha employs an inexpensive printing technique for his book, yet instills in them a signature style of typography and photography. The generic appearance veils the uniqueness of Ruscha's design. While being printed en masse the books remain singularly of his hand. Though an artist's multiple, they were meant to be books and they serve as books, open for all to read and interpret, road maps of the proto-history of an amoebic city. Every Building on the Sunset Strip reads as a narrative and as a linear commute, it depicts the fluctuant exchange between two points. Unique among Ruscha's books, the pages of Sunset Strip are folded into themselves. To be read correctly the book must be unfolded to reveal a twenty-seven foot strip of facades composing a section of Sunset Boulevard from the 8000-block to the 9100. The bottom half of the page is the north side of the Strip, the top half being the south side. In order to read the book one's eyes must travel, turn around (literally flip the book around) and continue along the other side of the street. In creation and reception, Sunset Strip is a commute. The images were created with a camera mounted in the bed of a pick up truck, taken as Ruscha drove down the Strip and stopping every fifty feet or so [vi]. The images, taken during the day, capture only the facades of the buildings. Ignorance is given to cars or people, both of which are often cut in half between separate exposures. The imperfections of matching the facades are cracks along Ruscha's drive. Through these cracks we find Ruscha, not such an anonymous author after all. Splitting cars in two, and mismatching facades we become keenly aware of the passage of time. The facades of buildings may appear as stage sets but they are active points on other itineraries, anticipating future and past narratives. Then, as now, the Sunset Strip is a place that comes alive at night, when the house lights go down and the players make their appearance. An assumption can be made that Ruscha's images are vacant, as the only inhabitants are disregarded (cut-up). The road, however, is constant, as is Ruscha himself. Some facades are spliced while others are afforded an unobstructed view. We do not want to speculate as to the reason for this, but simply take from the formal decision that Ruscha was not stereotyping the city as a stage set without any backdrop, a "nothing," as he claimed [vii]. In his subtle technique, which is read by some as amateurization [viii], there is a sharp awareness of the geography of the city. Ruscha's nothing of the Sunset Strip was a record of a common landscape. This became the facade of a between-space of the city not unlike any strip to be passed through on a typical commute of Los Angeles. However, this movement becomes a potential itinerary through the city that escapes any collective consensus of identity for the city. This is both Ruscha's trace through the city, his narrative movement, while an open invitation to create our own movement. Ruscha activates these facades, creating a corridor of facades that anticipates movement. The cracks between exposures become reference points of the itinerant movement of Ruscha through the space of the Strip. If Ruscha wanted this to be only his map, how he was viewing the Sunset Strip, perhaps he would have created a painting. As a book available to 5000 readers, Ruscha was inviting others into his movement, to experience his city, and formulate further itineraries. The book and its facades would be common between readers but their commute and narrative would be their own. Ruscha leaves us with only end papers and a space between them. Any relation to the facts (addresses and facades only) was purely on the individual level. The facades are only superficial information, like lines on a road map incomplete if not followed. That Ed Ruscha would choose to document the landscape of greater Los Angeles in book form, printed in larger quantity than a typical artist's book, is a pointed comment on the lack of consensus for a common landscape. Sunset Strip encapsulates a form of greater Los Angeles that is a space defined purely through the individual movement within that space. 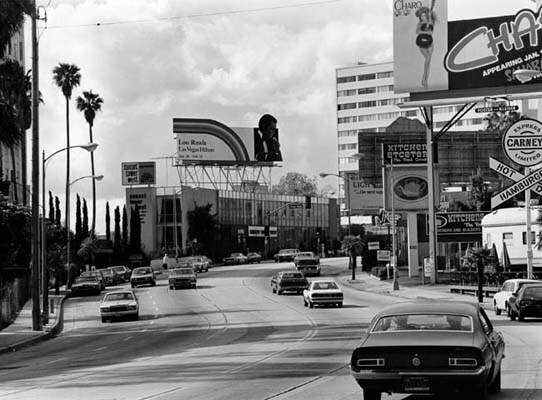 The Sunset Strip does not become Sunset Strip without the itinerant trace of Ruscha himself. The book becomes a mapping of one single narrative line through greater Los Angeles, a single commute among many. How can we consider a landscape to be common when each of us commutes differently? The actions of Ruscha's book play on this. A community of individuals holds this landscape, the Strip as witnessed by Ruscha, in common. Yet the images within the book are only one depiction of the landscape they convey, serving as a single, not communal, map of the actual landscape. The actual Strip is traversed by millions of lines of individuals moving through it, none of which duplicates Ruscha's track. Though each reader holds this landscape, the book, in common, no two readings duplicate. Even the movement of Ruscha is not to be reformulated with the information provided by the book, his presence (his present-tense) is always definite. Despite this, we cannot know where and when his movements begin and end. Though he claims otherwise, by maintaining the façade-lined Strip is "nothing," Ruscha is photographing the trace of himself. He cannot escape the movement and time he spends in photographing as he drives back and forth commuting along the Strip on a sunny California afternoon. Capturing both sides of the street with a backdrop of same-sky, we are able to see both sides of the street from both sides of the street. Ruscha is not in the middle of the road, but on the side of the street. We should be able to see him, and in the cracks he is still there. Ruscha's Sunset Strip not only epitomizes the itinerant form of greater Los Angeles as a commute space, it welcomes exchange and experience of Ruscha's commute through reading his itinerary along the Strip. Such exchange is crucial to Sunset Strip as well as his other books. These books often anticipated our recreation and individual exposition of lines he was drawing through greater Los Angeles. Some Los Angeles Apartments from 1965 invites vulnerability of the common landscape. The title advertises the arbitrariness of the subject matter and the images within. These could be any apartment buildings, though these are the ones Ruscha decided to photograph. Some residents of Los Angeles live in some Los Angeles apartments, each points on some itineraries. All residents know some Los Angeles apartments, Ruscha unveils what his sum of some is with the thought that we have known and will know some Los Angeles apartments in our commutes within the city. Like Apartments it would be false to assume Real Estate Opportunities (1970) as vacant images. Instead these are spaces of anticipation, voids waiting to be filled that were once inhabited. Ruscha, in photographing the lots, inhabits these spaces with his presence. The book opens these images up as spaces of anticipation, awaiting potential residents and readers to define these lots and experience Ruscha's itinerary. Furthermore Thirtyfour Parking Lots in Los Angeles contains only thirty-one images, leaving the final three for individual projection and discovery. Arbitrarily mapping the city Ruscha gives the reader a series of points between his end papers, a single movement among many potential. These itineraries of Ruscha are maps acting as intersections, a site where our movements and his can intersect and exchange. With Sunset Strip we know that thousands of individual movements converge within this space for nightly debauchery (little has changed since 1966). Ruscha tears away this nocturnal commotion; he strips it to show the linear structure of the space itself. In the daylight the Strip is naked, its beauty and its blemishes become apparent and its character as a commute space, a stage of infinite moving bodies, becomes more palpable [ix]. Intersections signify facades of the landscape, presumably common, as points where itineraries of disparate individuals congregate and signify the same space differently. The supposed dedifferentiated facades of buildings belie their own heterogeneous reality. Held in common the landscape of greater Los Angeles is transformed through the narrative of each individual commuting body. Following another's itinerary in a city alien to our own, their narrative mutates into our own. This exchange only enriches the weave of the urban web, celebrating its vastness of possibility. Though a presumptively common landscape is recorded and documented, each narrative reveals a different city. Mapped out, these recorded commutes activate landscapes as something other than what they are. These traces, such as Ruscha's, change our relation to the space we exist within. Itineraries provide first hand accounts of disparate landscapes, held within the same common space of greater Los Angeles, each transforming and renewing our relations to this space. When a building is torn down on the route taken from home to work, the city changes. Behind the facades of the commute lie other itineraries to be experienced. Perhaps we have forgotten. We are not the only individuals moving from point to point, there are millions of others, there always have been and will be many more. With traces left as itineraries, these narratives upon the common landscape reveal the web-form of locale, exchanged through the individualist experience. The untenability of greater Los Angeles lends itself to a topographic investigation as exemplified in Ruscha's books. In exchange such commutes as Ruscha's become locations of diverse happenings of narratives to be read and futures to be outlined. No single narrative overlays the urban web, no communal identity is certainly the identity of the city. A common landscape is now disparate landscapes, various narratives of infinite cities forming a polymorphous whole. If greater Los Angeles is to have an overall common identity, this identity will be the opening from which variant cities spread out in all dimensions, where the itinerant lines of individuals are exchanged and the legion of individual cities that create greater Los Angeles are revealed. Here we hold in uncommon each other's presumed common. [i] As the reader will have noticed, I have made a point of using the expression 'greater Los Angeles,' an expression I share with Reyner Banham though he was not the source for my usage. For this study to insist upon the City of, or County of Los Angeles, would be to draw arbitrary lines; lines to which the fluid and continually weaving urban web does not attend. Greater Los Angeles is a mutating amoeba of the many cities and counties (and unincorporated areas) that are a part of a great contiguous whole not easy to delineate through arbitrary, political boundaries. [ii] From the Los Angeles Visitors and Convention Bureau website. This appears to be the motto of the city, or at least the closest "official" motto I came across in my research. Nonetheless it is quite apt for the study at hand. 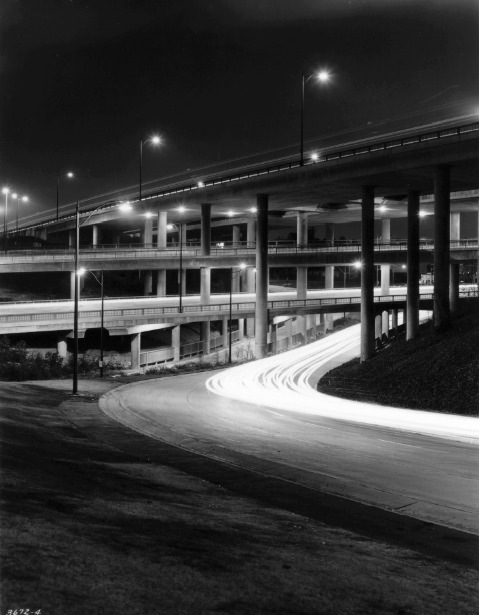 [iii] The common postmodern myth and debate around Los Angeles, as epitomized in writings by the aforementioned Davis, Jameson, or Soja revolves around issues of centricity/periphery. Condemning sprawl and nostalgic for Modern notions of a radial city, such debates remain stuck in search of an order framed through discreet space and centralized points of community, rather than a new order of linearity and movement that recognizes the individual creation of city as the reality of a polymorphous Los Angeles. Davis' schizophrenic vision (verging toward paranoia) reveals a chaotic, out of control vision of Los Angeles, as epitomized in his Ecology of Fear. Not too far off this are Edward Soja and Frederic Jameson who found Los Angeles as the epitome of Postmodernity, a space of capitalism run amok. Soja, in his essay "Taking Los Angeles Apart" attempts to centralize the city through a reading of it as exemplary of Bentham's famous panopticon prison, indeed defining Los Angeles as a controlled "sixty mile circle." Furthermore Frederic Jameson has quite famously, in his Cultural Logic of Late Capitalism, read Los Angeles as the dystopic and chaotic end of a postmodern world. I would oppose such readings of Los Angeles as chaos to Reyner Banham, a significant influence on my study, who's writings on Los Angeles (cited elsewhere) remain open to finding a new and unique order of Los Angeles that is not postmodern. [iv] "I had liked the anonymity of the whole thing... each book has an anonymity, a sort of pureness." Ed Ruscha, interview by Lewis McAdams, "Catching up with Ed Ruscha," ed. Alexandra Schwartz, Leave any Information at the Signal (Cambridge: The MIT Press, 2002) 239. 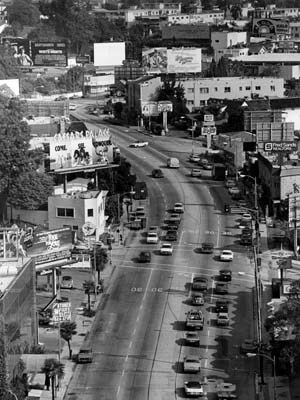 [v] The original edition of Every Building on the Sunset Strip cost $7.50, about $40 by today's standards. Of course the books now sell from $300 - $1500 on the secondary market, becoming an antithesis to their original intention. By all accounts the books sold rather quickly and were unavailable about as soon as they were printed. Yet an edition of 5000 is quite large for the specialty market of photographic art books. [vi] Neal Benezra and Kenny Brougher, Ed Ruscha (Zurich: Scalo, 2000) 205. All the details regarding Sunset Strip refer to the information provided in Ed Ruscha where they have listed the complete editions, sizes and small anecdotes regarding the publications. [vii] "It's like a Western town in a way. A store-front plane of a Western town is just paper, and everything behind it is just nothing." Ed Ruscha, interview with David Bourdon, "Ruscha as Publisher [or All Booked Up]," ed. Alexandra Schwartz, Leave any Information at the Signal (Cambridge: The MIT Press, 2002) 43. [viii] Jeff Wall speaks of Ruscha's books under this heading, which is "the issue of the de-skilling and re-skilling of the artist in a context defined by the culture industry, and made controversial by aspects of Pop art." From "Marks of Indifference," ed. Ann Goldstein and Anne Rorimer, Reconsidering the Object of Art: 1965-1975 (Los Angeles: The Museum of Contemporary Art, 1995) 248. [ix] Robert Venturi and Denise Scott Brown's Learning from Las Vegas attempts similar clarity with the Las Vegas Strip. Appropriately they make reference to Ruscha, the precursor to their investigation, as they perform an " 'Edward Ruscha' elevation of the Strip." (Cambridge: MIT Press, 1977) 32.